It’s a great time of year for Niagara Region residents to experience a relaxing hotel stay in the city because the annual Sleep Cheap Charities Reap Event is back again for its 14th year. Sleep Cheap is a great event that gives Niagara residents the chance to book Niagara Falls hotel rooms, water park experiences, and attractions at highly-discounted rates, with proceeds going to local charities. Since its inception, Sleep Cheap has raised over $1,700,000 and is a local tradition that benefits the community while offering amazing Niagara Falls experiences. 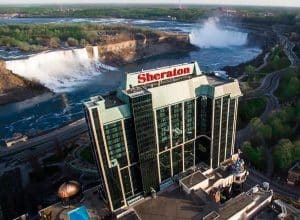 Twenty-three hotels are participating in this year’s event including the Sheraton on the Falls, Marriott Fallsview & Spa, Skyline Hotel & Waterpark, and Marriott on the Falls. Minimum donations for rooms are $35 for a standard room, $45 for a Fallsview room, $65 for a whirlpool room, and $85 for a room with access to a waterpark, and stays are available from Sunday November 12th to Thursday November 16th. You can visit www.sleepcheapcharitiesreap.com for more information on the event, and www.niagarafallssleepcheap.ca to book a room with us at the Sheraton on the Falls.